Perpetual Groove has become a rock band. That’s the impression fans got when they heard one of the rock & roll tracks from Perpetual Groove’s new album, LIVELOVEDIE at the band’s sold out New Year’s Eve performance. LIVELOVEDIE was produced by Grammy winner Robert Hannon (Outkast - Speakerboxxx/The Love Below) and Perpetual Groove. The album was produced with renewable energy through Perpetual Groove’s partnership with Tree Sound Studios, Sustainable Waves, and Green Mountain Energy Company and is being released by the environmentally progressive label, Tree Leaf Music. A celebrated, international touring act for over four years, Perpetual Groove has built a reputation on intense, emotional music that fans call “trance arena rock,” and won over legions of fans with their experimentations in live 5.1 concert surround sound, an intense retina blinding light show, and a willingness to keep the connection strong between band and fans. The Athens, GA-based band’s riveting live performances have catapulted them into the “must-see” category of live rock bands. With a funky blend of jazz-rock, neo-psychedelia, R&B, trance electronica, progressive rock and anthemic arena rock, the Bonnaroo veterans have conquered the festival circuit and continue to tour relentlessly. “We are really excited to bring these new songs to our fans. We’re the same band you have come to know and love, but like any good artist, we change. Where we are in our lives changes, so what we write about changes. Our songwriting has improved leaps and bounds since the last record,” says Brock Butler, singer & guitar player for the band. LIVELOVEDIE is a departure for the quartet. With a stronger focus on lyrics and song structure and a much heavier overall sound, the album is sure to surprise even the most die-hard of “PGroove” listeners. Perpetual Groove has shown a flair for creating genre-spanning music, yet keeps their catalog fresh and unique by constantly changing the material in the live setting. Rising out of the low country of Savannah, GA in 2001, Perpetual Groove has grown quickly into a formidable internationally touring organization. Now based in Athens, GA, the band continues to ride an unending wave of momentum buoyed by an enthusiastic fan base and international critical acclaim. Fans of Perpetual Groove (or PGroove, as the fans like to call them) are known to follow the band from state to state, night to night, to experience their euphoric live show that features an ever changing set-list. Perpetual Groove’s music has evolved into a genre-bending, highly original sound that touches upon jazz-rock, neo-psychedelia, R&B, trance electronica, progressive rock, and anthemic arena rock. Their large catalog of original music offers something for everyone, but the band is also known for their eclectic range of covers; including everything from Michael Jackson’s “Thriller” to Rage Against The Machine’s “Bulls On Parade”. The addition of an intense, retina burning, intelligent light show creates an atmosphere unlike any other, assuring fans they’ll get a highly polished, yet different show each night. Perpetual Groove released their first album, Sweet Oblivious Antidote, in 2003 on Harmonized Records after their first year of solid touring. Besides being the top seller for The Home Grown Music Network that year (it out-sold releases by Phish, Widespread Panic, and others), it was also voted HGMN Top Fan Pick for 2003. The buzz only got bigger on the 2004 follow-up record, All This Everything, which was produced by Grammy award-winner Robert Hannon. LIVELOVEDIE, their third record was released in March of 2007 and represents a significant evolutionary departure in style for Perpetual Groove. Teaming up once again with Hannon and Tree Sound Studios, the band set forth to create a darker sonic landscape without sacrificing too much of that “PGroove quality” thanks in part to Butler’s warm, soaring vocals. By partnering with Tree Sound Studios, Sustainable Waves, and Green Mountain Energy Company, Perpetual Groove is leaving a positive impact on the environment while they conduct their business. The band’s latest release, LIVELOVEDIE was produced with renewable energy, and each time the band tours, their carbon emissions are offset with renewable energy credits. The Spring 2007 Tour alone generated 50 tons of CO2 emissions, all of which were offset with help from Green Mountain Energy Company. That’s equal roughly to 60050 cars driving 3958483 miles. Where ever possible, Perpetual Groove uses recycled materials for the creation of tour cards and flyers, posters, and even album packaging, of which, the latest was made from 100% post consumer/industrial waste materials. Perpetual Groove’s online ticketing and merchandise websites also help to leave a positive impact. Patrons of both stores have the option of “greening up” their ticket which a renewable energy credit to offset the emissions from traveling to the show. Perpetual Groove’s environmental initiatives exist to serve as an example to their fans, that one person at a time can make a difference, and more importantly, leave a positive impact on their environment. Perpetual Groove continues to tour nationally and internationally, with over 150 shows scheduled each year. With that kind of tour commitment and experience, Perpetual Groove brings not only the kind of show that’s talked about long after the bus has left town, but an established a reputation for being an extremely courteous and professional outfit with all eyes on the future. 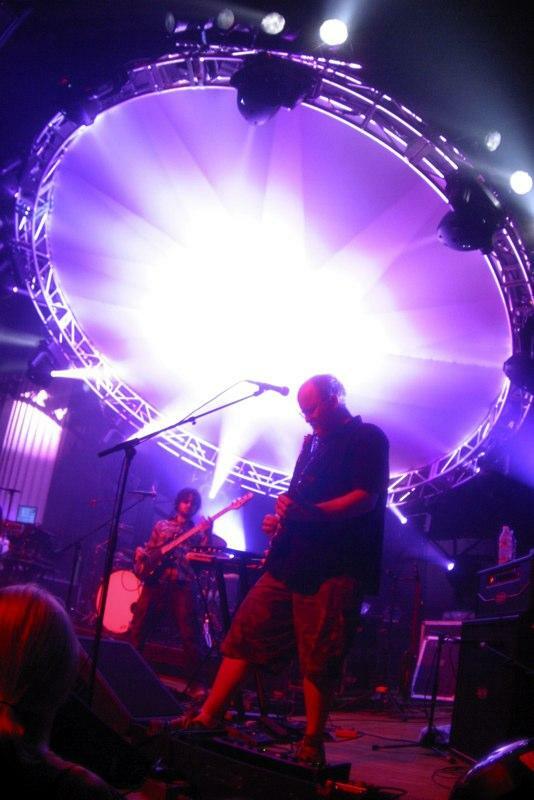 Perpetual Groove has performed at the country’s top festivals, including: Bonnaroo, Jam Cruise, Wakarusa, Langerado, High Sierra Music Festival, The Xingolati Groove Cruise, 10,000 Lakes Festival, Atlanta’s Music Midtown, Smilefest, moe.down, Camp Bisco, The Green Apple Festival, and Chattanooga’s Riverbend Festival. The band’s Bonnaroo performance had over 20,000 people in attendance and was considered by many to be one of the highlight’s of the festival. Perpetual Groove regularly produces their own “special events” such as: Amberland - an annual outdoor weekend camping and concert event, Dinner With The Band - offers fans an intimate catered dinner VIP experience with a private performance, The Cave Sessions - an intimate live recorded performance at Tree Sound Studios for a very limited audience, New Year’s Eve - multi-night stand with a gigantic production and stage gags galore.The NYE runs are quickly becoming legendary among the fan-base.